It was not only on the screen that DC Comics struggled to find a place for Wonder Woman in the American fiction lexicon. Sales of Wonder Woman comic books were initially strong, but it wasn’t long before her circulation began to dwindle and drastic measures were employed to take the character into a new era. Thus, from 1968-1972, Wonder Woman renounced her superpowers and became a boutique-owning, Emma Peel-style crime fighter. Purists and feminists cried foul and after four years the “classic” Wonder Woman returned. This superpower-less period, however, was the iteration that would lead to Wonder Woman’s first live-action television appearance (a campy presentation was filmed by the Batman TV people in 1966 but never aired.) The 1974 telefilm WONDER WOMAN, starring tennis champ Cathy Lee Crosby in the title role, finally brought the heroine into the living rooms of America . . . with mixed results. A master criminal named Abner Smith has gotten hold of a series of code books detailing the identities and missions of US secret agents abroad. Smith threatens to reveal these details if he doesn’t get several million dollars in ransom. Secret agent Steve Trevor tries to hatch a plan to stop the nefarious Smith, but knows that this is really a job for his top agent Diana Prince, codenamed: WONDER WOMAN. People like myself who grew up on the later Lynda Carter Wonder Woman TV series will find this version a somewhat head-scratching experience, though not necessarily an unrewarding one. Crosby, a blonde (oh, the sacrilege!) is charming, funny and athletic as the Amazon Princess. However, this Wonder Woman has none of the attributes we’ve come to associate with the franchise: no golden lasso, no bust-boosting bustier and her invisible plane gets but a passing mention. If we divorce ourselves from all that came before and after, there is a good time to be had during the film’s brisk 75 minute running time. The story clips along a decent pace which is both a plus and a minus. While the pacing keeps the audience alert, it leaves quite a bit to be desired in the character development department. The film often feels less like an introduction and more like the viewer has tuned into an ongoing series a few episodes into the run. This is most evident with the character of Ahnjayla, a renegade Amazon who joins forces with Abner Smith against Wonder Woman. We meet Ahnjayla in a flashback scene where Diana is preparing to leave Paradise Island to enter the “world of men.” Ahnjayla is presented as a woman bored with life on the island, a friendly rival of Diana’s who is longing for adventure. The character is then forgotten until the last quarter of the film where she reappears, having deserted Paradise Island and in league with the villains, quite prepared to kill Diana for reasons that are never really clear. Exploitation film favorite Anitra Ford plays Ahnjayla with a sneer and beguiling sexuality that is really quite effective. The audience immediately wants to know more about her and why she is motivated to kill her lifelong friend. The answer never comes and I can only assume the relationship would have been explored further had the pilot film gone to series. The two Amazons engage in a javelin battle that is the highlight of the film. 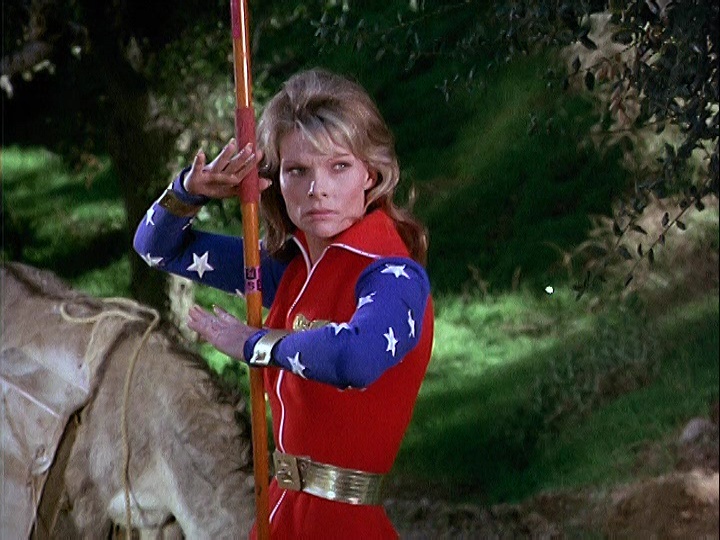 Cathy Lee Crosby is given a chance to show her athletic prowess and in almost every shot it is quite apparent that Wonder Woman’s fighting is being performed by Crosby herself and not a stuntwoman. At one point Ford’s javelin comes so close to Crosby’s head that it actually catches in her hair. While a bustier would have been out of place for this version of Wonder Woman, the costume they do come up with is just plain silly. 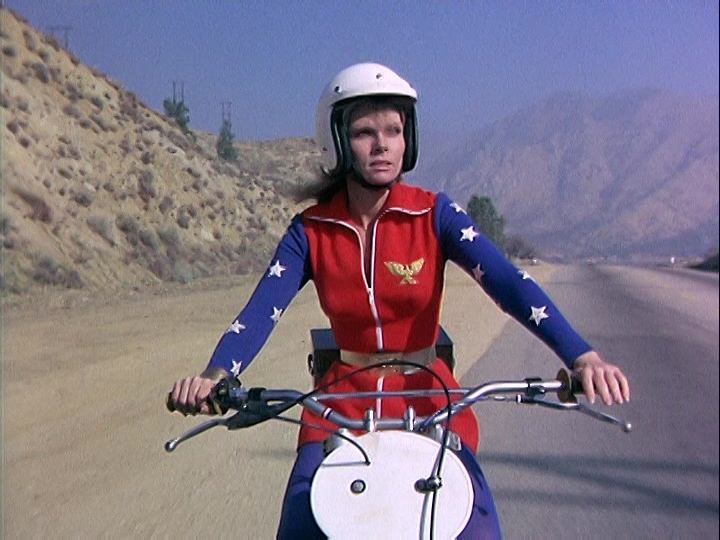 The high-collared zipper jacket and tights make Crosby look more like a female Evel Knievel than a superheroine, but she does get a nifty “utility belt” and bracelets that double as grappling hooks. Andrew Prine plays the villain’s sidekick and chews the scenery to bits, making everyone else look better in the process. In fact, everyone besides Prine plays their parts with a dead seriousness that is necessary to make this sort of entertainment work. Speaking of the male members of the cast, Kaz Garas makes a handsome and effective Steve Trevor who, refreshingly for the 70’s, respects the talents of his subordinate Diana without any condescension or sexual pestering. His brief scenes are dotted throughout the film, letting Diana find her own way out of scrapes, never becoming a damsel in distress. There isn’t a lot of action in WONDER WOMAN, but the fleeting action sequences are quite well done. In one scene Diana barely escapes getting plowed down by a car by launching herself onto a storefront canopy and in another she uses brains over brawn to escape from a poisonous snake. 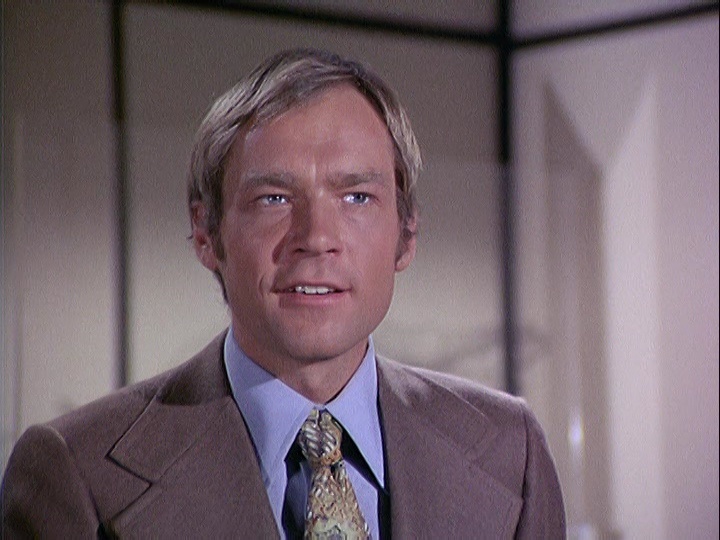 Ratings for the telefilm, which debuted on March 12, 1974, were respectable and Crosby’s performance was praised. 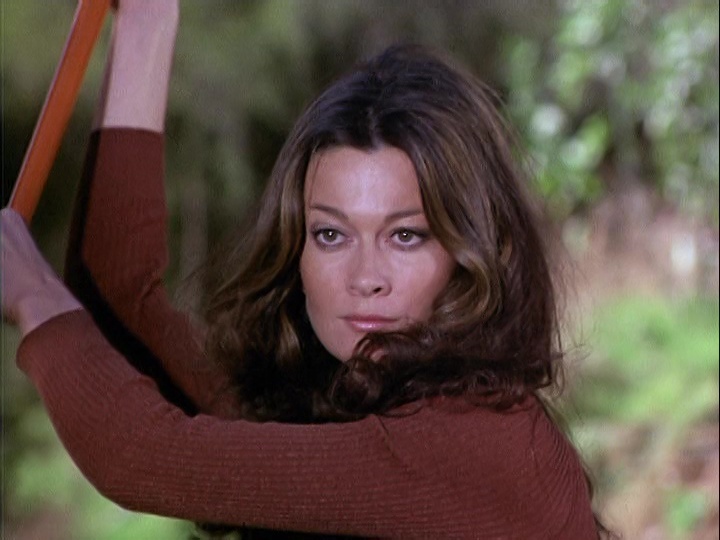 Despite this, ABC declined to pick up the series and the creative team decided to take a different tack: returning the character to her World War II roots and relaunching with Crosby’s role inhabited by Lynda Carter. The results were iconic. Time has not been kind to the reputation of the Crosby film. While many single out a blonde leading-lady (she’s a secret agent, maybe she dyed it, people!) or the costuming being bereft of bustier, I think the reasons for the film’s lack of lasting impact is more fundamental: this just doesn’t feel like WONDER WOMAN. With its great cast, a disco-porntastic soundtrack, decent (if generic) plot, high production values and entertaining action sequences this could have turned into a first-rate secret agent series, one of the first to have a female lead who isn’t beholden to a male upper-hand. But, that wasn’t to be and the film fell into obscurity soon after the Lynda Carter series took off. Over the years WONDER WOMAN occasionally turned up on late-night TV and cable networks, but lacked a broad audience until it was released on DVD-R as part of the Warner Archive manufacture-on-demand series. It’s worth picking up, despite a few moments of letdown. WONDER WOMAN remains an interesting chapter in the career of Princess Diana. It may not be the most successful, but it was the beginning and Cathy Lee Crosby will always hold the mantle of TV’s first Amazon Princess.